“Garbage mounds near landfill sites are above 45 metres. These are almost like towers as like Qutub Minar. Height of Qutub Minar is 73 metres and these mounds are more than half the size. It's an alarming situation. Who is going to deal with it? You (government) have to deal with the problem”, a bench of Justices M B Lokur and Adarsh Kumar Goel said. 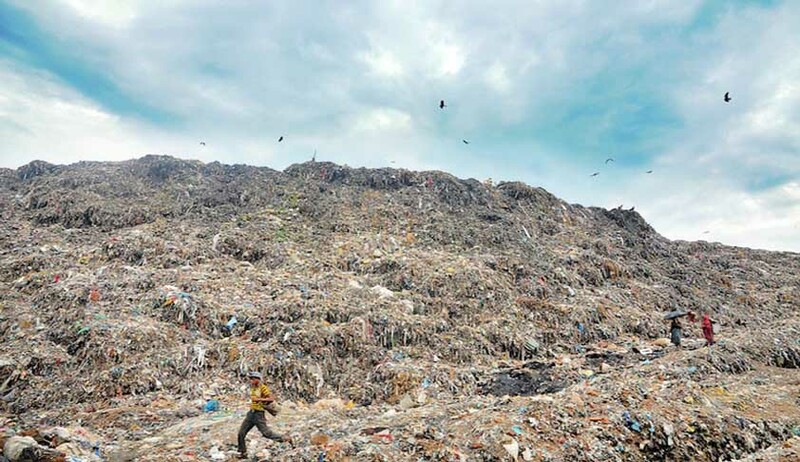 The observations came when Solicitor General Ranjit Kumar appearing for Delhi Chief Secretary pointed out that near three landfill sites at Okhla, Gazipur and Bhalswa, there are garbage mounds of the height of 45 metres. The bench asked Delhi government standing counsel Rahul Mehra that the AAP had MLAs across Delhi who could create awareness among the people about garbage disposal. The PIL in Supreme Court for devising a strategy to control the spread of vector-borne diseases like dengue and chikungunya opened another front on October 17 with the apex court seeking answers on solid waste management in the national capital. Three land fill sites in the national capital of Delhi – Ghazipur, Bhalaswa and Oklha are overflowing. “People are dying are you aware of that? It is a health hazard...very very serious health hazard”, a bench of justices Madan B Lokur and Adarsh Kumar Goel had asked while seeking a status report on landfill sites issue by today. When Solicitor General Ranjit Kumar said they were taking steps for timely clearance of the garbage, Justice Lokur asked “Everything is fine but after collecting the garbage where do you keep it ? When the judges were told that they are dumped on land fill sites in various parts of the capital, justice Lokur asked “people are dying are you aware of that? It’s a health hazard...very very serious health hazard. On October 7, the court had directed a meeting of the Chief Minster, heads of civic bodies, chiefs of all relevant agencies tomorrow to devise a strategy to control the spread of vector-borne diseases like dengue and chikungunya and urged all the “stop the blame game”. “Blame game is the biggest problem. Everybody keeps blaming everybody. We have had enough of blame game”, the bench had said. The bench expressed satisfaction on the fresh affidavit filed by the health minister Satyendar Jain which listed a series of steps government was taking like the use of 300 fogging, fumigation machines, 1000 beds to be increased in three government hospitals, plan to increase the number of mohalla clinics to 1000 by the year end etc. But Justice Lokur was angry that the minister had not named the “officials officers reporting to the LG” who were not cooperating and taking responsibility in curbing the diseases. “Why have you not disclosed the name of officials”, the bench asked. In the affidavit Jain has accused his secretary Chandrakar Bharti of dereliction of duty and not taking preventive measures to prevent the outbreak of chikungunya. He claimed Bharti was not available for discussion on several occasions and also disobeyed his request to participate in meetings. Jain said the secretary believed that the Lieutenant Governor and not the minister was the competent authority. He submitted the L-G appointed Bharti as health secretary despite the minister’s request not to do so. The previous incumbent, Indian Revenue Service officer, Tarun Seem had undertaken suitable initiatives, he said. But after perusing the affidavit, the bench asked “earlier you said no officer is willing to take responsibility to sign any document. How do we assume this secretary is inimical? You had said officials. Who are they? Why have you not named them ? No this is not what we had asked”. As the number of dengue and chikungunya cases in Delhi skyrocketed, the Supreme Court had on September 26 sought a status report from Delhi government, all three municipal corporations and the NDMC on a PIL which blamed inadequate preventive measures steps for the widespread outbreak of mosquito-borne diseases. The court converted a public interest litigation filed by a doctor Anil Mittal into a suo motu matter (court on its own taking interest) and sought responses from these bodies.